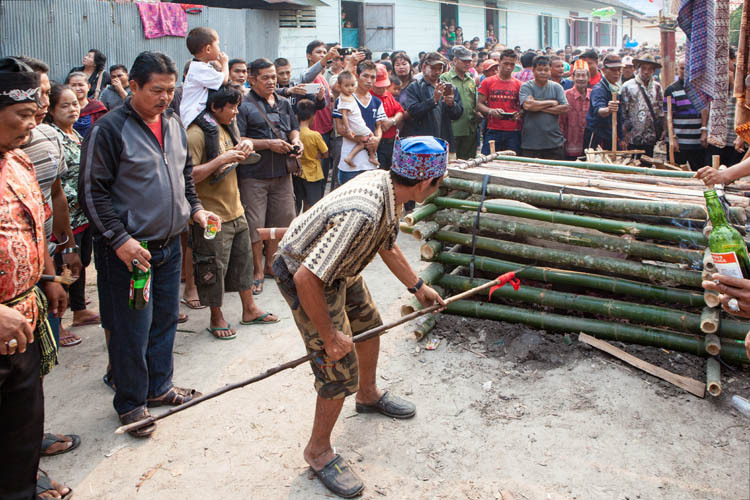 I’ve previously written about the Tiwah (Dayak funeral ritual) that we attended back in November last year, and about another very large Tiwah in August this year. Both were quite extraordinary. When we heard that another mass Tiwah was being held in the village of Kampuri, we quickly made arrangements to attend. 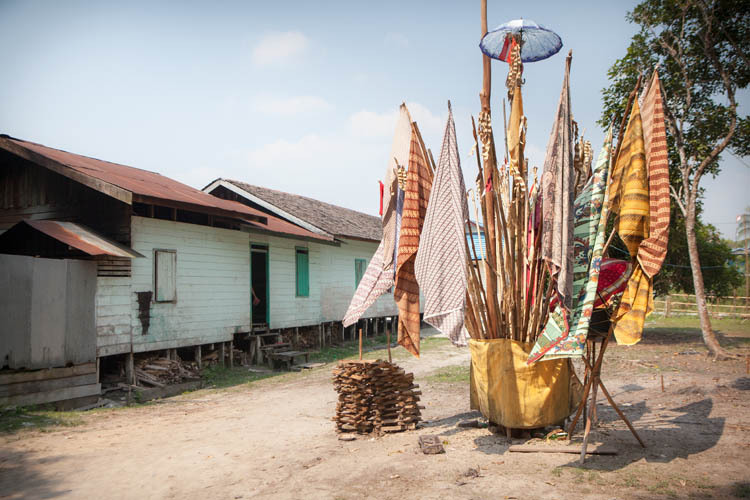 Kampuri is a village of around 600 families, in the Gunung Mas region of Central Kalimantan, about three hours drive to the northeast from where we live. It’s on the Kahayan River, whereas the two earlier ceremonies were on the Katingan River to the west of here. We were very interested to see how different the Kaharingan religious practices might be. By a happy coincidence, my workmate (and our friend) Ibu Andarini is from Kampuri, and she very kindly provided us with transport, accommodation and great company for the main ceremonial days (Tubuh Basir Muduk and Tubuh Ngarahang Tulang) of the Tiwah. We were the only non-Indonesians there. 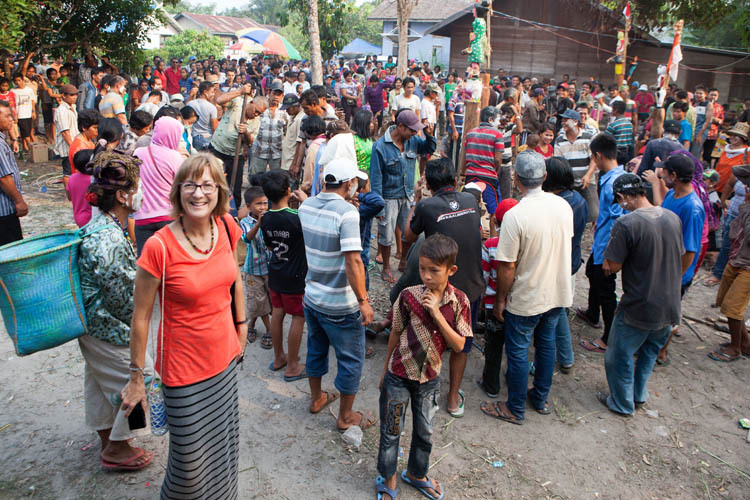 When we first arrived, the ceremonial site had been prepared, but things were pretty quiet, so we drove an hour north to the district (Kabupaten) capital of Kuala Kurun, and stayed overnight with members of Andarini’s family there – who made us very welcome. Seventeen tall painted wooden sapundu were erected, one for each of the deceased. The poles were securely planted in deep holes in the ground. On top of each one was carved a stylised representation of the deceased. One man who had served in the army, for example, was depicted in khaki and carrying a rifle. 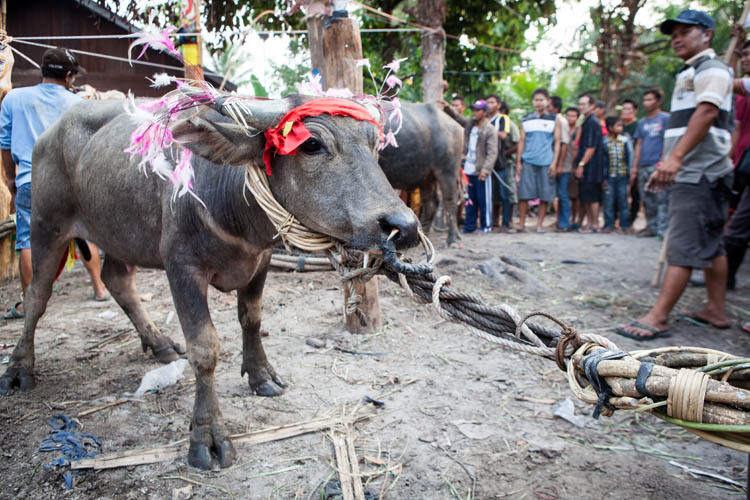 The sapundu are used to tether the buffalo and cattle that will be sacrificed during the tiwah. 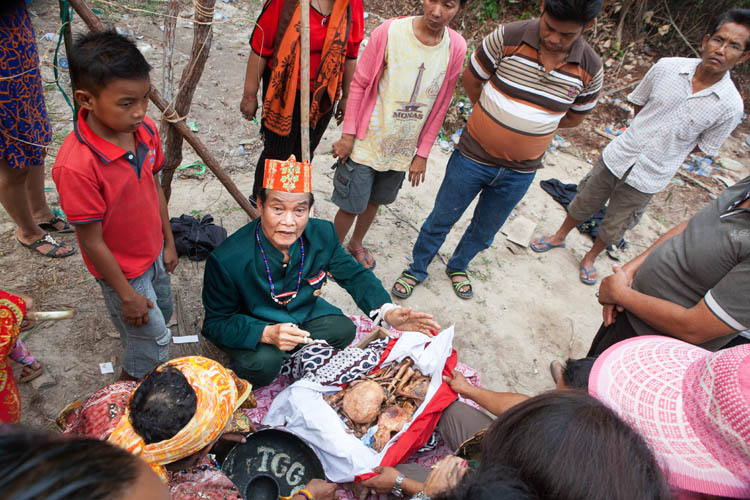 The rituals of Tiwah are part of the Dayak Kaharingan religion. Adherents of this animist faith believe that the spirit of someone who has died will stay around the village that was their home in life, and will not be able to make the journey on to the ‘Prosperous village’ (i.e. Heaven) without assistance and encouragement. So there are prayers, music and offerings to get the assistance of beneficial spirits (and to repel the malevolent ones). 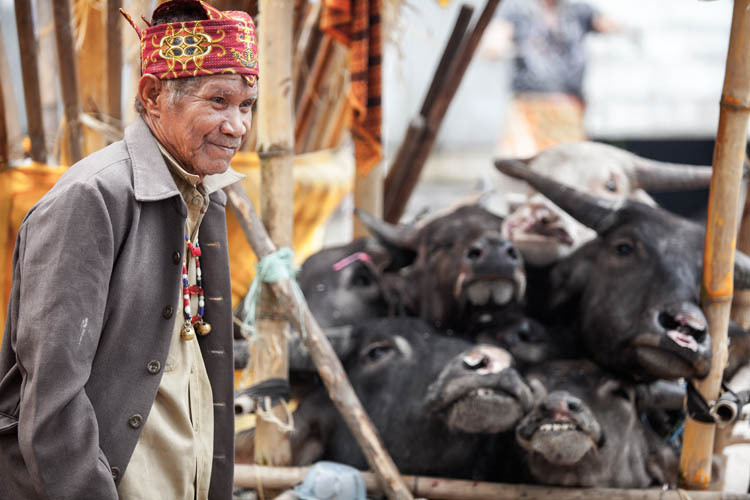 Chickens, pigs, cattle and buffalo are sacrificed, and the animals’ spirits will also accompany the deceased and support them when they arrive at the ancestral spirit village. The gods and spirits are very finicky about protocol, and the complicated rituals must be performed exactly if they are to be successful. 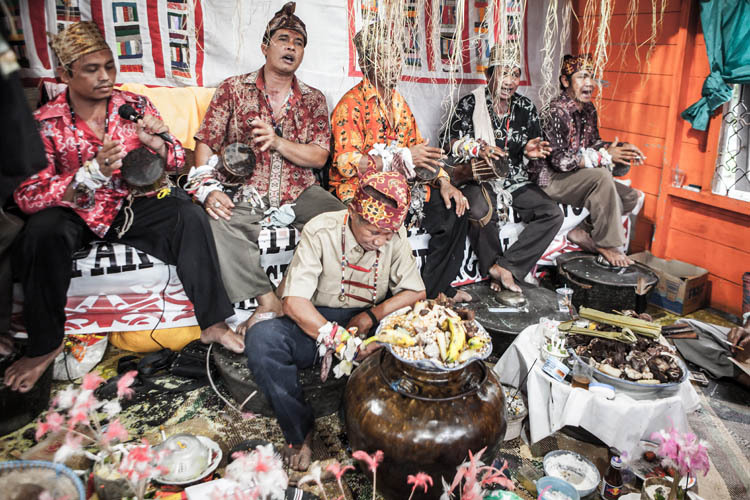 So one or more basir, experts in the minutiae of Kaharingan ritual and the sacred language of Sangiang, are required to preside over proceedings and to keep it all on track. At Kampuri, there were nine of them, mostly wearing rattan caps with the word ‘basir’ woven in so there could be doubt of their role and status. They were an amiable group, keen to try and explain things to us whenever time and our limited bahasa language skills allowed. 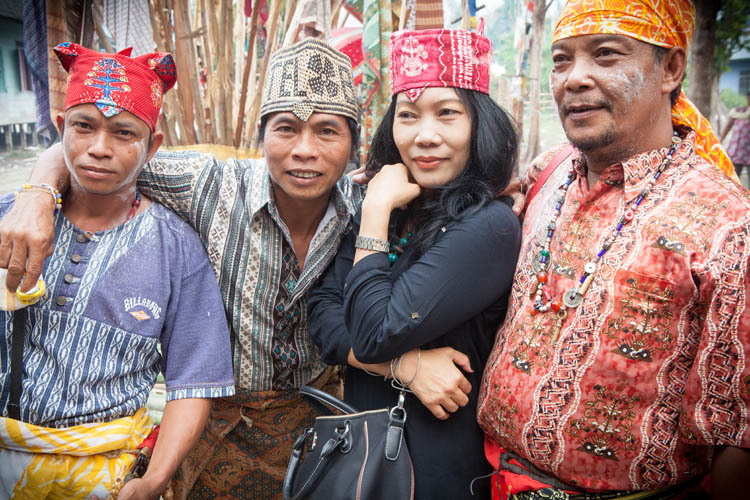 And, like all Indonesians, they were ready to pose for photos at the drop of a (rattan) hat. 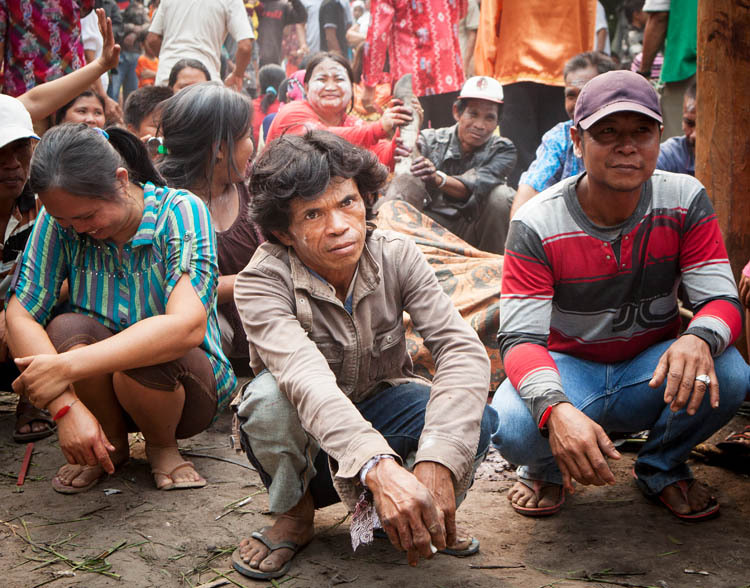 There weren’t nearly as many prayers and songs as we had seen at the Tiwah on the Katingan River, but the ones that did occur were quite beautiful, in an extended, hypnotically repetitive cycle of solo voice and chorus responses. The little drums (katambung) that they play are significant, and their use is one of the things that distinguish the basir of the Kahayan from the pisur of the Katingan. Their prayers, chants and music went on well into the night. 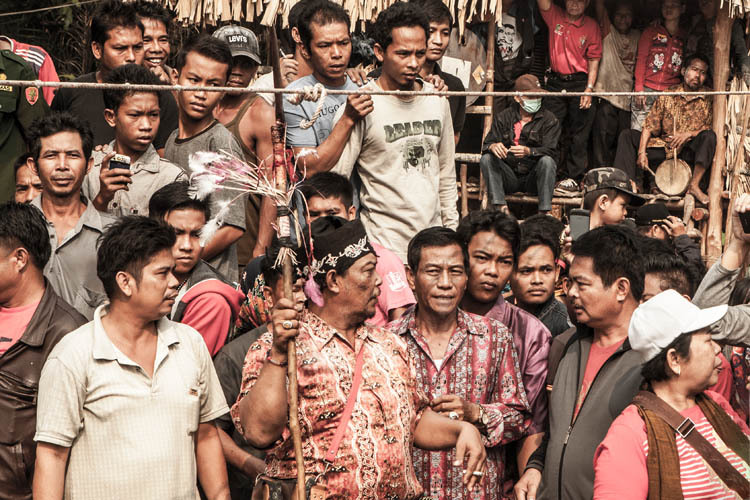 By day, the crowd was generally more boisterous than those we saw on the Katingan. 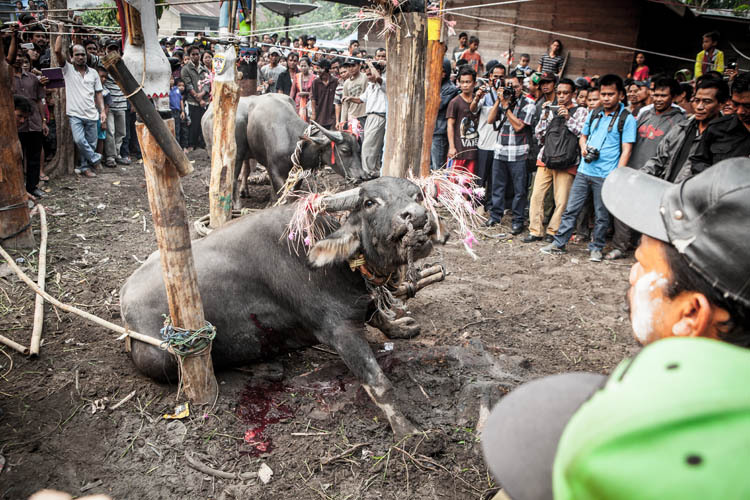 There were frequent outbreaks of hujan tanah (literally, ‘raining dirt’) where clods of soil (perhaps later mixed with some buffalo faeces and blood…) would be picked up and lobbed across the heads of the crowd. After I got targeted and pelted a couple of times, including one quite solid missile that hit me square in the glasses, I expressed my clear displeasure and invited the throwers to come over and discuss the matter in more detail. That seemed to be the end of it. 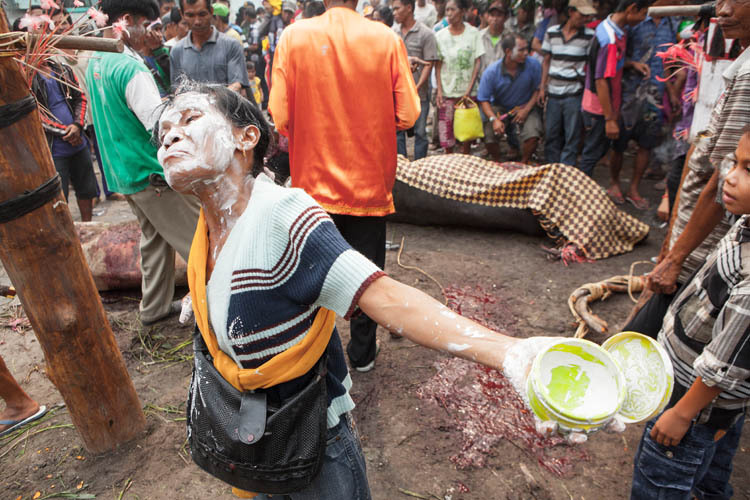 More benign were the people who moved through the crowd, applying white rice flour paste to the faces of all present. We are not certain of the ritual significance of this paste, but the lady below made a fine advertisement for its beautifying effect. On each day, the first animals to be sacrificed were the pigs (babi). 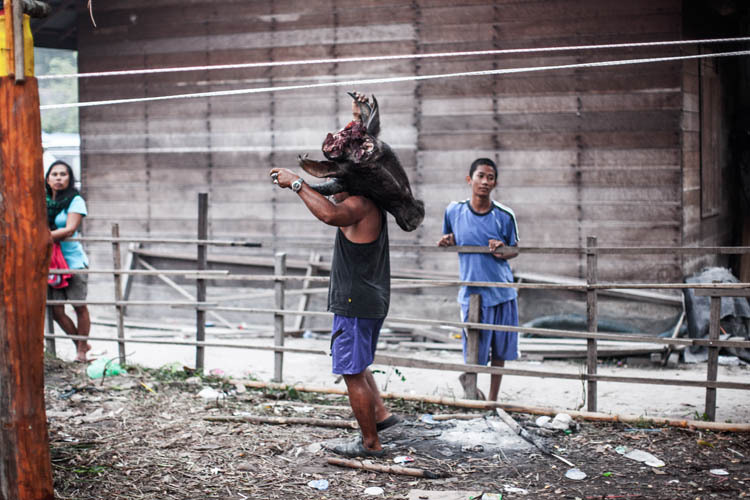 Unlike on the Katingan, where the pigs were slaughtered very quickly and relatively painlessly by a knife to the heart, the largest babi Kampuri were speared while held in a bamboo enclosure. Each family member took a turn, and so it took a little while, and the squeals of the indignant pigs were heartbreaking to hear. 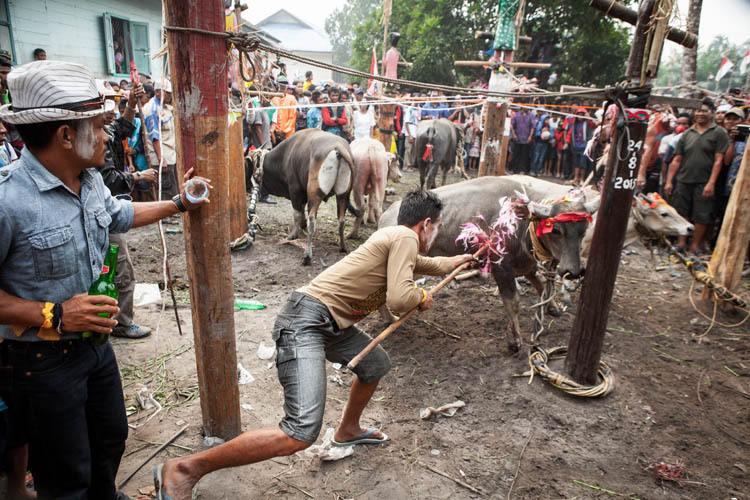 The mass Tiwah was held for the souls of some 17 people, and there was a major sacrifice – usually a buffalo (kerbau), but sometimes a cow (sapi) – for each one. The buffalo can cost up to nearly the equivalent of AU$1000, so it is a very major expense for each of the families that provide them. The decorated animals are brought out one by one, and tied to the appropriate sapundu with a halter (saluang) made from rattan. 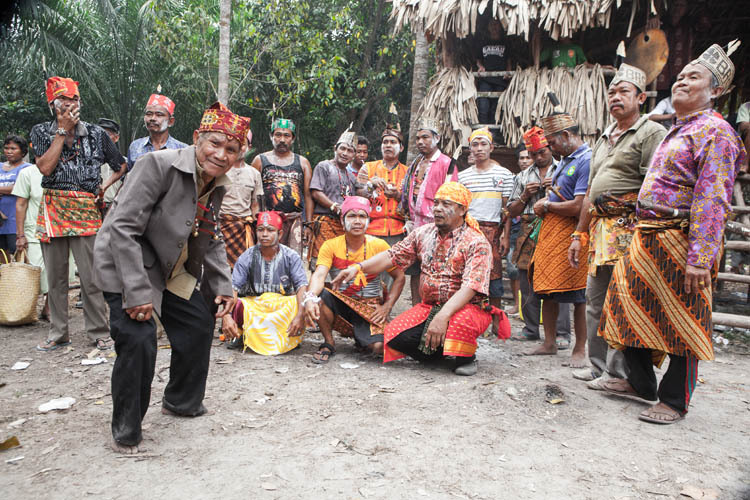 The basir and key family members formed a ring around the sapundu, each one now with a buffalo attached, and performed the slow dance of Ngangjun, Pakai selendang, which invites the spirits to descend to the village and take up temporary residence in the sapundu. 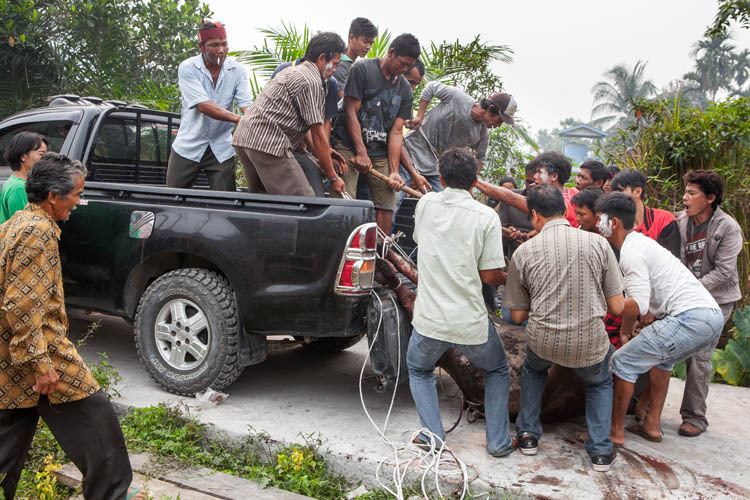 The family members then take turns to spear the buffalo. The spear (tombak) is long and decorated with red fabric and pink and white chicken feathers. Afterward, the spearer was given a glass of rice wine (or beer), which was downed quickly then he (or she) would face east, raise their head and let out a loud ‘Woooo!!!’. The spearing continues until the beast can no longer stand up, at which point a wooden block is placed under the beast’s head, and its throat is cut. Unlike the Katingan Tiwah, there was less interest in collecting the spilt blood, or washing hands and feet ‘clean’ in it. 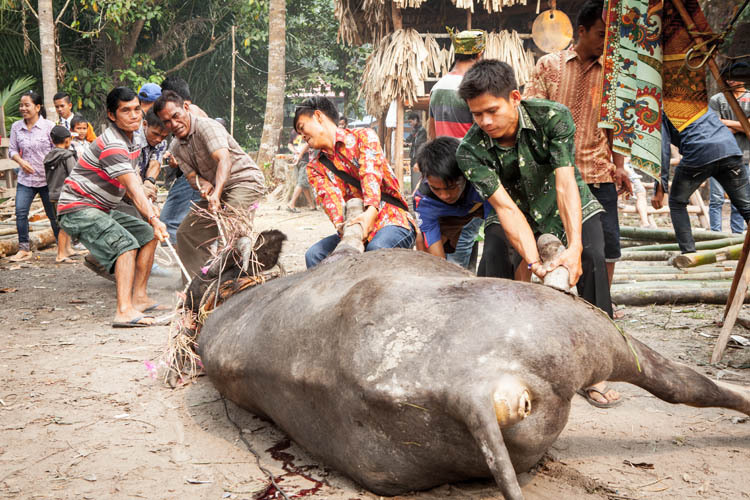 A batik cloth is thrown over the animal, the family members all gather and squat down around it, and a basir waves a clump of leaves over their heads. 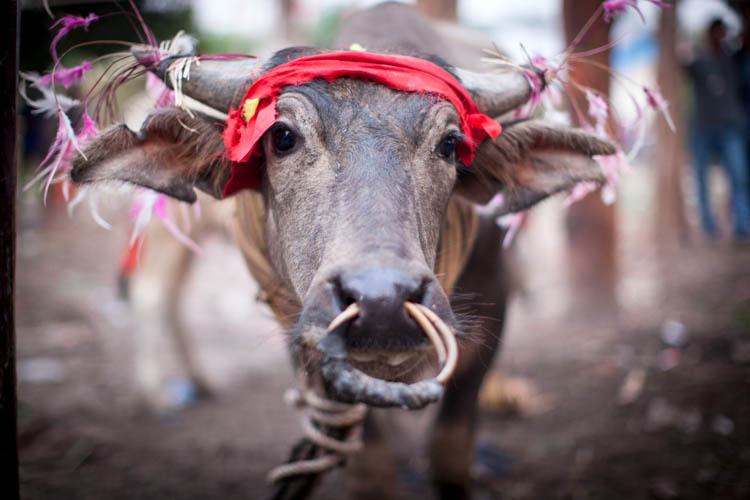 Small pieces of the rattan that had tied the buffalo to the sapundu, or even bits of the animal itself (lips and nose) were collected by people to take away as good luck talismans. At the completion of ceremony, the animal is hauled away, for butchering, distribution and cooking. Not an easy task. Its even harder to load onto the back of a ute. But, like most things in Indonesia, it can be accomplished if you have enough people, a couple of basic bits of equipment, and a lot of shouted advice. The heads were taken away to be stored and displayed at the main ceremonial area. The Tiwah is a ‘secondary funeral’. That is, it is held for people who had died and had been buried some time previously – often many years earlier. The bones of the deceased are exhumed from the site of burial, carefully cleaned and placed on fine cloth in small wooden trays or coffins. 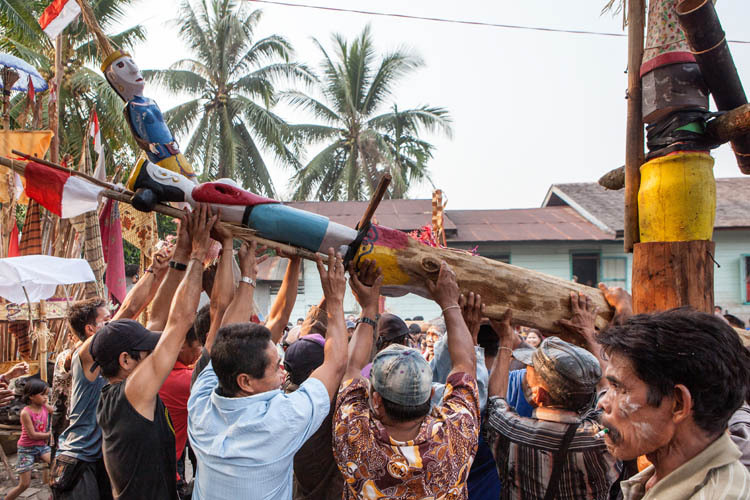 They are then taken to the specially built wooden structures (sandung) where they join the bones of other family members who had pre-deceased them. All going well with the performance of the Tiwah, their souls join the ancestors in the ‘Prosperous’ village’. Our understanding and appreciation of the Kampuri Tiwah was greatly assisted by Pak Goldison (2nd from left below), who was the basir chiefly responsible for the organisation of the Tiwah. He was a very busy man, but he went out of his way to ensure that we were comfortable, well informed and well supplied with drinks and food throughout our stay. And of course without Ibu Andarini (3rd from right) we probably wouldn’t have got there at all. She ensured that we had a place to stay (there is no commercial accommodation in Kampuri), that we didn’t miss any of the key events, and that we were made welcome by her family and friends in the village. And when it’s all over, it’s time to go back home. Five on a bike? No problem. More of my photos of the Kampuri Tiwah here. This entry was posted in Indonesia and tagged Central Kalimantan, Dayak Ngaju, Gunung Mas, Kaharingan, Kahayan, Kalimantan Tengah, Kampuri, Kuala Kurun, sandung, sapundu, Tiwah. Bookmark the permalink.